The validity of a phantom replacement (i.e. external reference) method of phosphorous metabolite quantification is examined by using an internal reference method. Phosphorus-31 magnetic resonance spectroscopic imaging (31P MRSI) data were collected from the whole head of twenty subjects. Phosphorus-31 MRSI external reference data were acquired from a 2.5-liter spherical phantom containing a 50 mM solution of inorganic phosphate (KH2PO4). Internal reference data were acquired from the anterior cingulate and left ventral lateral prefrontal cortices of all twenty subjects via single voxel proton (1H) MRS. Statistical analyses found no differences between the phantom replacement method and1H MRS internal referencing. 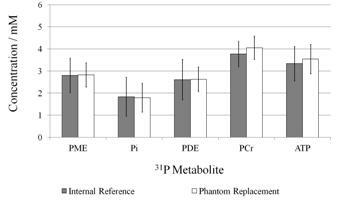 The results suggest that phantom replacement can be used for in vivo 31P MRS/MRSI quantification studies.